We all know that burglars and thieves like to work out of sight. That's why they hate security lighting. 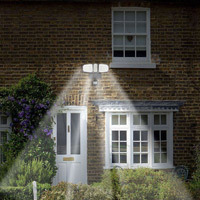 We find that security lighting installed in the correct locations are an excellent low cost deterent for anyone snooping around that shouldn't be. High level security floodlights with PIR (passive infra red) activationare perfect for bathing your garden in light when and intruder is detected. It's also great for when you need to pop down the garden at night to fetch something. 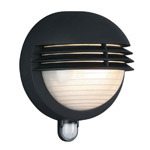 Any dark or cover pathways around your property can utilise PIR activated wall mounted lighting that is also decorational so as to add to the asthetics of your garden during daylight times. In our opinion, sensor triggered security lighting is an absolute must for any property, the cost outlay is minimal for the added security and functionality they bring.